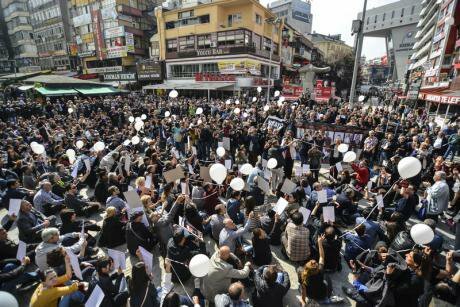 Ankara protests massacre holding white balloons in remembrance of their friends, October 13. Demotix/ Recep Yilmaz. All rights reserved. On October 10, one of the deadliest bomb incidents in the history of the Turkish Republic shook both domestic and international public opinion. Photos and videos of people covered in blood, then smothered by tear gas shot by the police at an Ankara peace rally were indeed appalling and terrifying. And yet, the sheer spectacle of the horrendous carnage can only hint at the complexity of the wound inflicted on Turkish society by the attack. Younger generations have said that they were initiated into political awareness and mobilization by the Occupy Gezi events in the summer of 2013. That year was the year of great hopes, not only because of the revival of grassroots politics, but also because a new political party, the Peoples’ Democratic Party (HDP) led mainly by Turkey’s Kurds, came into existence to serve as an umbrella organization uniting several marginalized groups. Two years later, despite a brief euphoric interlude after the 7 June general elections, moods are gravitating towards hopelessness. The main reason is that the governing Justice and Development Party (AKP) deploys illegitimate tactics to confiscate or subjugate alternative modes of political engagement. As far as dissident movements and parliamentary opposition are concerned, most efforts to devise ways of voicing demands or addressing wrongs are barred by cunning maneuvers ranging from taking advantage of legal loopholes to outright oppression. The government’s method in responding to the Ankara attack that cost more than a hundred lives harks back the memory of the 1990s, the darkest period in the “low intensity war” with the Kurds in Turkey. Instead of breaking (as it often likes to claim) with a long tradition of authoritarian state power, the AKP is undeniably perpetrating it. Any struggle or initiative that could potentially decentralize the state apparatus so as to allow a space to breathe for languages, ethnicities, religious or ideological affiliations not sanctioned by official representations of ‘Turkishness’ have been severely crushed throughout the history of the Republic. The 1990s was when the country was literally split into two: on the one hand, Kurds in the southeastern provinces lived under a State of Emergency that gave extraordinary powers to governors and the Turkish armed forces to carry out homicide, imprisonment, censorship and village evacuations. On the other hand, the Turkish public in the rest of the country was brought to believe that the Kurdish question was the outcome of the treachery of a band of terrorists whose eradication was the only means of dealing with the problem. Terrorism is a real synch word, but not in the sense we have come to think of it. It dates back to the French Revolution when it referred to state-induced terror, that of Robespierre out on a witch hunt among his very comrades. Opponents of Tsarist Russia then ‘democratized’ the term, bringing it within the reach of the populace whose only means of resistance against an absolutist regime was to disturb the ordinariness of everyday submission by disseminating fear and terror. The French resistance was ‘terrorist’ in the eyes of the Nazis and their collaborators. The bombing of the King David Hotel in Jerusalem in 1946 by an underground Zionist group was one instance of the deployment of terrorist tactics to overthrow colonizers and imperialist powers. In time, all of the previous connotations of the term were relegated to oblivion. Terrorism became a term that designates a threat to the state’s monopoly over the means of violence and summons the executive prerogative, i.e., the right of a state to short-circuit democratic processes of deliberation so as to decide on an effective course of action in eliminating that threat. The US ‘war on terror’ is one such instance in recent history, and the Turkish state’s present crackdown on Kurds and opponents is another. What the two cases have in common is the pretext that the term ‘terrorism’ provides for disregarding basic rights and liberties. It’s not that the latter are enough to protect lives in the face of governmental prerogatives, but they can serve as discursive weapons to be used and cited by social groups and movements in their struggle to resist overarching forms of power. What the quasi-sacred term ‘terrorism’ does today is to curb the will and the ability to resist arbitrary rule. What the quasi-sacred term ‘terrorism’ does today is to curb the will and the ability to resist arbitrary rule. In Turkey, the serial production of dead bodies has reached a critical mass between June and mid-October: 694 people died, more than 200 of whom were not members of the state’s security forces or of the Kurdish guerillas. Bombs shattered lives and limbs in three peaceful rallies in Diyarbakır, Suruç and Ankara. The methods and technology used in all three attacks were the same. These can indeed be classified as instances of ‘terrorism’, but there is more. The equation “PKK=terrorist=HDP” has been persistently repeated and drummed into the general public’s mind since March, when President Recep Tayyip Erdoğan began to publicly criticize the road map to peace negotiated between the government and the HDP. In striking contrast, the PKK’s imprisoned leader Abdullah Öcalan’s letter was read later to a large crowd of Kurds gathered on March 21 for the annual Newroz (Kurdish New Year) celebrations. Taking the peace process seriously, Öcalan called on the guerillas to hold a conference to discuss the prospect of laying down their arms. Taking the peace process seriously, Öcalan called on the guerillas to …discuss the prospect of laying down their arms. Disregarding the will of his own party’s government, President Erdoğan also opposed the establishment of a monitoring committee to oversee the peace negotiations and denied that there is such a thing as the “Kurdish problem” in Turkey. Erdoğan was in turn criticized by the deputy prime minister for meddling in affairs that lie under the jurisdiction of the cabinet. But the government soon succumbed to the voice of its master. The AKP ‘accidentally’ omitted the peace process from its electoral manifesto. In April, AKP’s parliamentary majority voted in a draconian security bill that allowed for strip searches and 48-hour detention periods. It gave license to the police to use firearms and to ‘remove’ protestors during demonstrations to unspecified locations (not necessarily to the police station). The bill virtually turned every public protest into an ‘act of terrorism’. Furthermore, Prime Minister Davutoğlu called the HDP “a gang of violence, a gang of terror” and Erdoğan said it was “propped up by terrorists.” The accusations came at a time when the HDP was preparing to compete in general elections as a political party that promised peace, participatory democracy, gender equality, freedom of expression, conscience and sexual orientation. In May, 56 attacks on HDP offices were reported throughout Turkey, some of which were encouraged by local governors appointed by the AKP. Thus, well ahead of the June 7 elections in which the HDP obtained 13.2% of the national vote and got 80 deputies into parliament, the AKP was already preparing for a “fight against terrorism.” Conspicuously enough, a similar preemptive logic was not applied to ISIS. Earlier on in the year the AKP rejected a parliamentary motion to launch an investigation into the activities carried out by ISIS in Turkey. Since we now know with a fair amount of certainty that the bomb attacks in Diyarbakır, Suruç and Ankara were the work of ISIS, this omission seems even more dubious. The duplicity of the government – paying lip service to peace with the Kurds domestically while assuming an extremely hostile stance since 2014 towards Syrian Kurds fighting ISIS – hints at how the AKP was caught between two or more fires. The pro-PKK Democratic Union Party (PYD) was instrumental in ousting ISIS from parts of northern Syria and establishing the autonomous Kurdish enclave of Kobane. The government was being cornered by both the geopolitical game and the electoral game. The government was being cornered by both the geopolitical game and the electoral game. Turkish and foreign analysts have mainly focused on how the peace process broke down when the PKK declared it would be resuming its armed activities in the aftermath of the Suruç massacre.The PKK might indeed have overestimated its chances of riding the revolutionary wind blowing from Kobane in order to declare autonomy in the Kurdish-populated provinces of Turkey. US support of the PYD also played a role in this miscalculation. In any case, it chose to instigate an armed uprising in such a way as to cast a shadow on HDP’s electoral victory. But what often goes unnoticed is the government’s unwillingness in allowing the new parliament to function. Having passed the 10% electoral threshold, one of the most undemocratic provisions in the 1982 Constitution drafted under the aegis of putschist generals, the HDP was ready to revive the peace talks and propose to establish truth commissions on the massacres, executions and forced disappearances of recent history. Through legal but largely illegitimate moves the AKP, which is still the largest party in parliament, stalled negotiations with a view to forming a coalition and then called for snap elections on November 1. Ever since, there is a fierce upsurge in state violence against both Kurds and Turkish dissidents. The so-called ‘war on terror’ has literally turned into a war against whole cities or districts in southeastern Turkey. The town of Cizre was not the first, neither the last to undergo military siege and curfew, but in Cizre this lasted for 8 days. Civilians, among them several children, were shot by snipers or killed by mortar fire. The inhabitants of the town under siege suffered water and food shortages; electricity, telecommunication, medicine and health care was unavailable for days on end. Massive arrests, dozens of raids into homes and newspaper offices, and numerous lawsuits against suspected “terrorists” followed suite. Meanwhile, 128 HDP offices were attacked in a single night on September 8 by what appeared to be ultra-nationalist mobs, although there are indications that youth groups affiliated with the AKP were also involved. 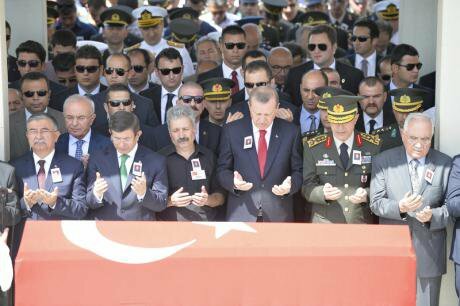 Erdogan and top officials In Ankara to mourn soldiers killed by the PKK, September 2015. Demotix/Recep Yilmaz. All rights reserved.This spiral of violence and finger pointing has resulted in dividing Turkish society, perhaps not as severely as in the 1990s, but severely enough. The technological difference between then and now is that social media enables the circulation of news and opinion that conventional mainstream media censors. The photographs of wounded or dead Kurdish civilians and guerilla, reports filed by human rights groups, and opinion expressed by the opposition can now be circulated – which is why the AKP government frequently imposes social media blackouts. Whether the social media help alleviate the polarization is another question. Ethnic hatred (Kurds depicted as “dogs”, “bastards” and even “Armenians”), disinformation and mud slinging are as widespread on Internet as they are on print or on the screen. they were thinking about “Peace=terrorism” in a manner reminiscent of George Orwell’s 1984. This is one of the reasons why the October 10 Ankara rally was organized by several labor unions and political parties: it was an attempt to allow the expression of demands for peace viva voce. The rally was to provide an occasion for the supporters of peace to make a bodily appearance, thus exhibiting their solidarity with the Kurds and hoping to put pressure on the government to stop cracking down on the opposition. In an evil twist of fate, hundreds of bodies were destroyed that day – and so too the sanity of those who believed they could still sway the hardened nationalist sentiments of Turkish citizens. Obviously, the fans were reiterating the official equation “PKK=terrorism=HDP”, but this time the equation had been expanded in order to include peace demonstrators and activists. It was as if they were thinking about “Peace=terrorism” in a manner reminiscent of George Orwell’s 1984. Even worse, it was as if those who perished in Ankara were responsible for their own death. This is indeed the sign of deep social trauma. But is it surprising that such confusion may arise in the hearts and minds of citizens when a state besieges its own towns and perpetrates terror among its own population? The outlook is grim indeed.